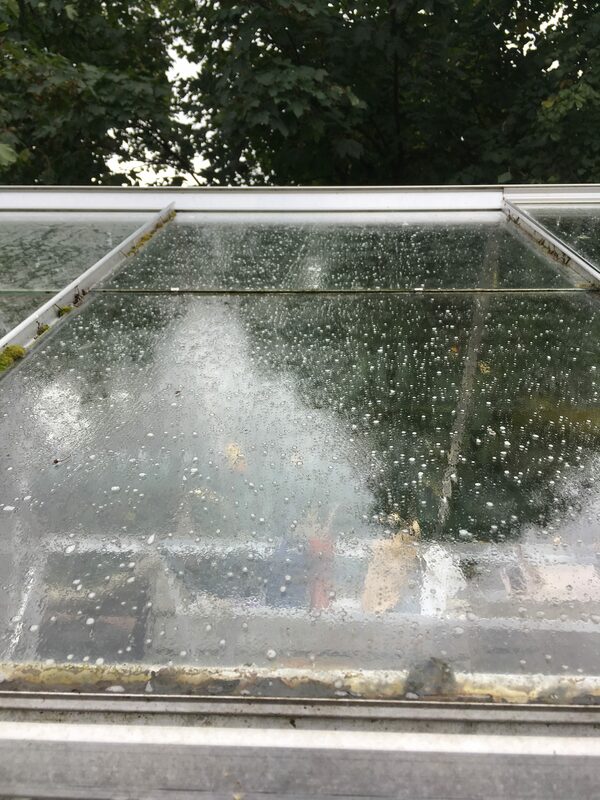 I think most people will agree that cleaning a greenhouse is not a very nice job but it does need to be done regularly to ensure good light levels. 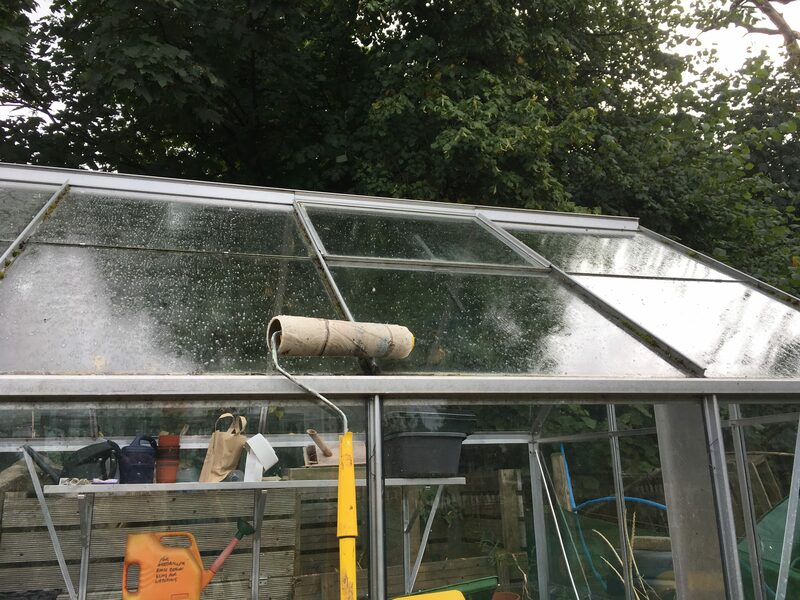 The first time I cleaned our greenhouse at the allotment I did it by hand with a bucket of water and a few cloths using Jeyes Fluid, what a mistake, everything, including my clothes smelt of Jeyes Fluid for weeks! The following year I decided to try using a patio cleaner, drenching the roof and sides and leaving the sun to kill off the algae. It worked really well so I’ve done the same this year but with some changes to the method which worked even better. 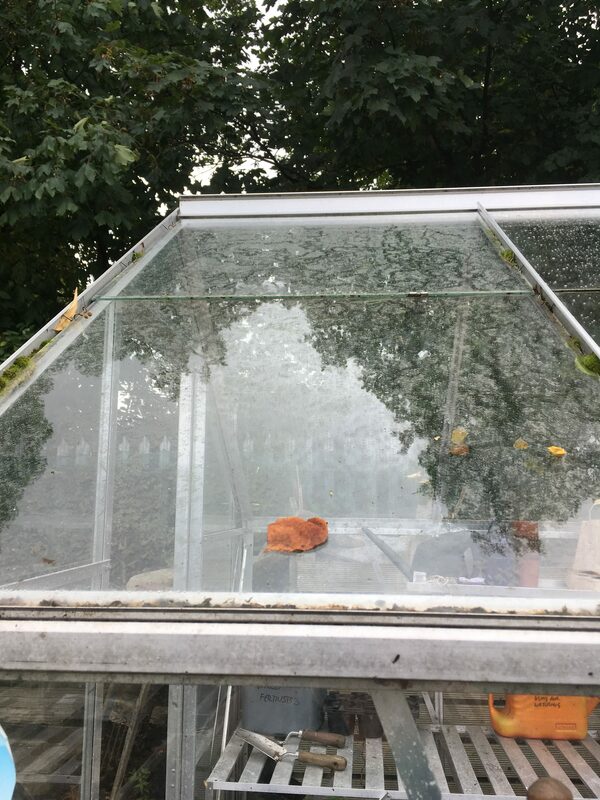 The sides of the greenhouse were still quite clean but the roof had a thin layer of algae over the whole area, which you may be able to see from the picture. This is where I concentrated my efforts. 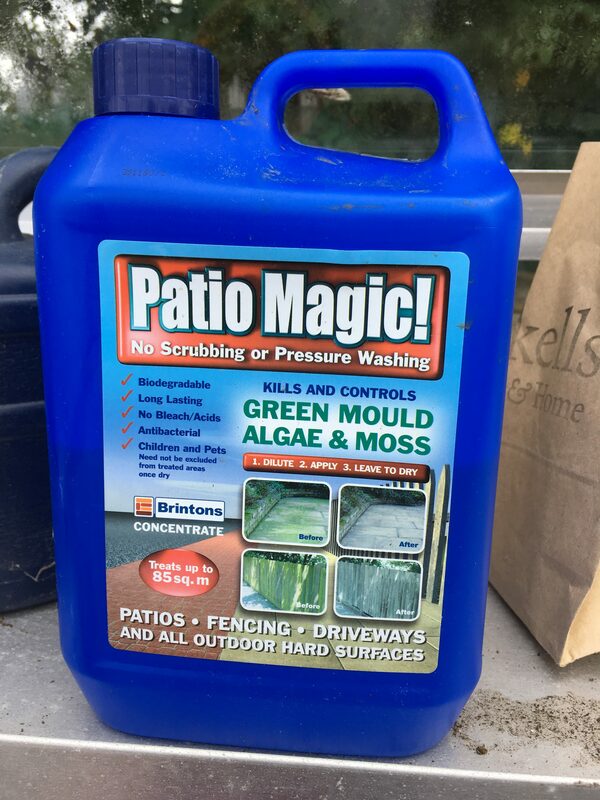 The treatment I used, which I also use on my patios and paving around the allotment, is Patio Magic which I have seen available at DIY stores such as B&Q as well as some Garden Centres. Other similar products may work just as well. The idea behind this disinfectant treatment is that it kills green mould, algae and moss and helps to prevent it recurring. Mix with water, 1:4, in a watering can and “water” it on to the dry surface. Leave for 2-4 days and all sign of moss and algae will have gone. It is important that you water this onto a dry surface and only do so if it is not forecast to rain within the next 5-6 hours. The main difficulty for me is reaching the top of the roof to apply the product, last year I used a broom, but this year I cobbled together a much better device! I took an extendable painting roller and attached a partly used kitchen roll to the end (you could use an actual paint roller too), once drenched in Patio Magic it was easy to reach the top of the roof and roll the product over the whole area. It took me less than 15 minutes to complete the greenhouse and now I’ve left it to do it’s thing. Be sure to read the instructions carefully before using.